Mohebichamkhorami, F., Alizadeh, A. (2017). Skin Substitutes; an Updated Review of Products from Year 1980 to 2017. Journal of Applied Biotechnology Reports, 4(3), 615-623. Fariba Mohebichamkhorami; Akram Alizadeh. "Skin Substitutes; an Updated Review of Products from Year 1980 to 2017". 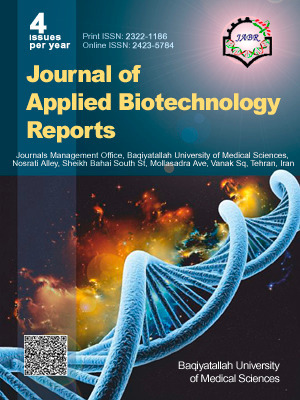 Journal of Applied Biotechnology Reports, 4, 3, 2017, 615-623. Mohebichamkhorami, F., Alizadeh, A. (2017). 'Skin Substitutes; an Updated Review of Products from Year 1980 to 2017', Journal of Applied Biotechnology Reports, 4(3), pp. 615-623. Mohebichamkhorami, F., Alizadeh, A. Skin Substitutes; an Updated Review of Products from Year 1980 to 2017. Journal of Applied Biotechnology Reports, 2017; 4(3): 615-623. Skin substitutes help skin repair and regeneration, and restore the efficient properties of skin in the time of acute burn injuries or other chronic skin lesions. They can act as permanent skin replacements or temporary wound covers, depending on their composition and, design. Recent studies have overcome some obstacles, but till today no ideal skin substitute has been developed. The aim of this study is to introduce some commercially available and under development products and also to provide information about these substitutes and their limitations in order to use native-like skin substitute design and production. Currently, the accessible skin substitutes have several limitations such as infection risk, reduced vascularization and lack of integration to host tissue. The absence of various cells which are responsible for temperature control and insulation, pigmentation, immune regulation and nerve supply is among the mentioned limitations. Further researches will be required to resolve different issues and suggest practical solutions toward a true skin substitute with excellent engraftment and durable viability. In addition, availability and awareness of these skin substitutes in developing countries is not adequate in spite of the number of cases requiring this kind of treatment, therefore, it is needed to develop indigenous economical technology to promote available treatments in hopes of achieving substitutes with higher quality and reasonable cost available to a greater percentage of patients.